Electronic scale is commonly seen in our daily life, with function of weighting. Professional scales on market have more functions with higher precision. 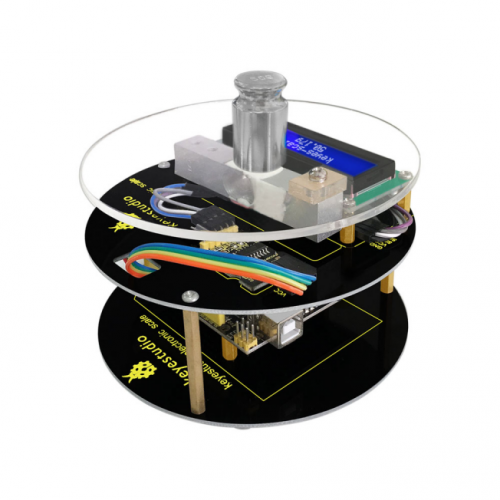 Is there any possibility for enthusiasts to DIY their own electronic scale with what they have learned? Absolutely you can! 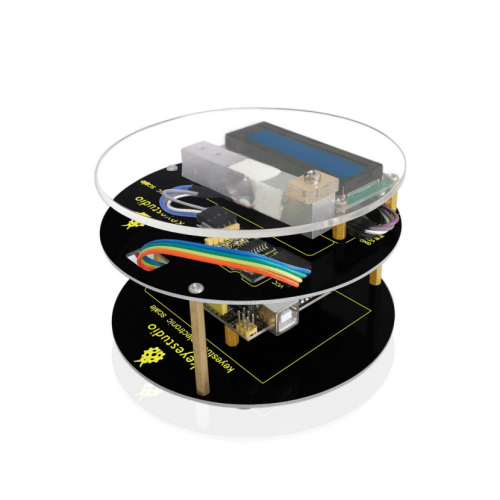 It is easy to make an open source electronic scale. You just need a weighting module, an AD chip (hx711) specialized in weighting and an Arduino with corresponding library. Everything becomes so easy! Electronic scale weigh force according to slight deformation causing by pressing metal. It uses the most commonly used strain gauge to measure deformation. In a typical application, utilize the strain gauge adhered on face of this sensor, to measure the force bore by the sensor. HX711 is a chip of 24 bit A\D converter, designed for high precision weighing sensor. Compared with other same-type chips, this chip is featured with high integration, quick response and strong anti-interference, integrated external circuit needed by other chips including stabilized voltage supply and on-chip clock oscillator. It decreases cost of complete machine of the scale, and in the same time improve its performance and reliability. The interface and programs of this chip and MCU chip are very simple. All control signals are driven by pins, without programming register of inner chip. Input and select switch to choose arbitrarily channel A or B, connecting it to a low-noise programmable amplifier. The gain in channel A is 128 or 64 bit, and its corresponding amplitude of different input signals in full loaded is respectively ±20mV or ±40mV. The gain in channel B is fixed 32, used to detect system parameters. Stabilized voltage supply offered by chip can directly supply power for external sensor and A\D converter, there no need for additional analog power on main board. Clock oscillator doesn't need any external device. Automatic reset simplifies initialization when opening up. Channel A or B can choose different input. The gain is 64 or 128 in the low-noise programmable amplifier. Stabilized voltage supply offered by chip can directly supply power for external sensor and A\D converter. Clock oscillator doesn't need any external device. If necessary, it can use external crystal oscillator or clock. All control signals are driven by pins, without programming register of inner chip. 1)VCC can be any value among 2.6-5.5 . 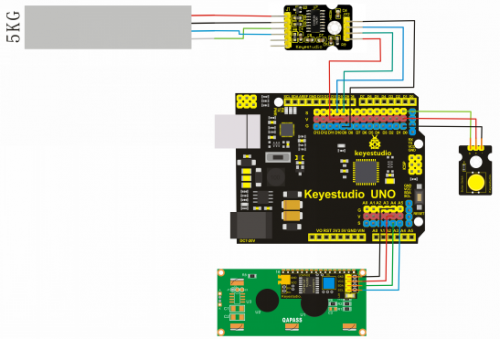 Because we use Arduino, just connect to 5V, and to GND. 2)Connect SCK to Pin 9, DT to Pin 10 on Arduino; you can change the pins in program. 4)Connect B+ and B- to sensor of channel B, or connect to power supply through partial pressure circuit, in order to detect supply voltage. If not, you had better connect to GND. But disconnect GND is OK.
For example: 5V supply voltage multiplied by 1.0mV/V sensitivity equals to 5mV full-range. In fact when supply voltage of the module is 5V, supply voltage of sensor is 4V, so full-range voltage of the sensor is 4mV. or you can choose 128 bit, the highest gain factor in channel A , to get highest precision. In the picture , the module connected to sensor is HX711, Arduino UNO is in the lower right corner, bridge sensor is hung on lazy arm(my connection mode is to use sling to measure tension value). It is better to choose the shorter wire between HX711 module and sensor. If it is too long, the module will get disturbed and it has better exceeding 30cm. If it is necessary to lengthen, you can use wire that can shield electromagnetism and signal amplifier. void set_offset(long offset = 0); // modifying deviant (default 1) , you can see hx711 also can use 4 parameters mode to define, and stipulate gain factor and correction factor. You can change gain and correction factor at any time during program running , and utilize deviant to remove tare. As for choosing channel and gain factor mentioned in materials, The gain in channel A is 128 or 64 bit, and its corresponding full-load voltage is respectively ±20mV or ±40mV. The gain in channel B is fixed 32 and full-load voltage is 80mV. Input voltage of each channel can’t be more than their full-load voltage. Of course, you can change channel and gain factor at any time, as long as you use function of set_amp(amp) during programming, but the value of amp only can be 128, 64 or 32. Stressing again, if you choose gain factor of 32 bit, the data read out is of channel B. You can see the first decimal has changed for 0.2. That means reading correction factor is not precise enough, but it fits completely precision at 1g. Every time you press the button, tare is removed. Due to influences of different factor ,such as temperature, environment, wires and more, actual error is about +-0.5. Put a 50g weight on tray, and the result is shown as below. This page was last edited on 20 March 2019, at 14:59.